Am up in the mountains this week, so I thought there wouldn't be much to blog about. Man, was I wrong. Got a ton of traffic and some very positive responses from my German teabloggers post from a few days ago. Better than that, I've connected with tea lovers closer to home. 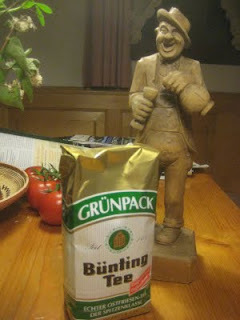 The thought of meeting some of these German teabloggers is much more feasible than some of the ones who're farther away. We'll see. They're certainly passionate, these local/regional tea enthusiasts. Brought some books on tea with me, but I can't put down David Foster Wallace's Infinite Jest, so there's no tea literature for me to review till now. To continue on my German tea theme this week, I've happened upon some very unassuming supermarket tea that I was very curious to try. I talked about my ridiculous desire to find decent, inexpensive supermarket tea a few weeks ago in drinking while unwell. As much as I love tea shops and rare tea, I'm always on the hunt for an excellent tea that is economical. It's probably a mix of the Holy Grail and a fool's errand, but there you have it. I've written about blending black tea in general and blends from Ostfriesland in particular here: You can have any colour you want...as long as it's black. 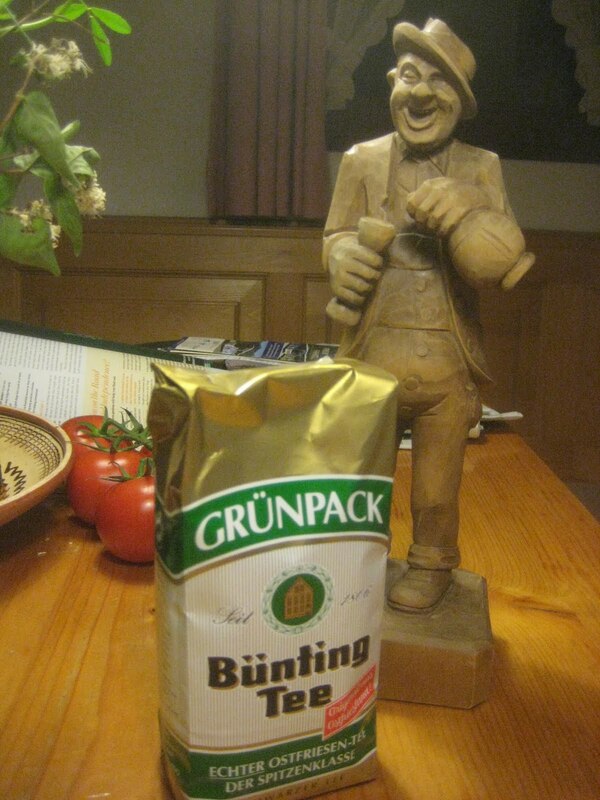 This is a well-known tea in Germany, and probably considered pretty questionable to tea snobs. But like I say, I'm on a quest to find quality tea at bargain prices. Wish I could say this was such a tea. It's certainly not a bad tea, but I have to try their tea in the higher price range. Strange as it may sound, I might use this tea as a blend with another tea. To be fair, there is a freshness to the taste. It's neither too dark nor completely flavourless. It's exactly what one might expect of a middle of the road black tea blend. And the price really is remarkable. The little statue in the photo above is clearly drinking something a bit stronger than tea. Welcome to Upper Bavaria. Oh, one other thing. At this point in my reading, there've been two fleeting references to tea in Infinite Jest. I've seriously considered blogging about each of them, but thought it'd only irritate whoever's still reading. But I'm desperately searching for any reason to talk about this book and tea. You've been warned.